The crossings through the Condamine River can get to depths that will be up the lower parts of your door but rocky base makes it easy to cross. This GPS log shows how to get to the gorge and where the creeks are. 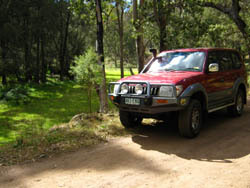 If you stay on the black top it will take you around the gorge up pass Queen Mary falls, picnic area and other bush walks.